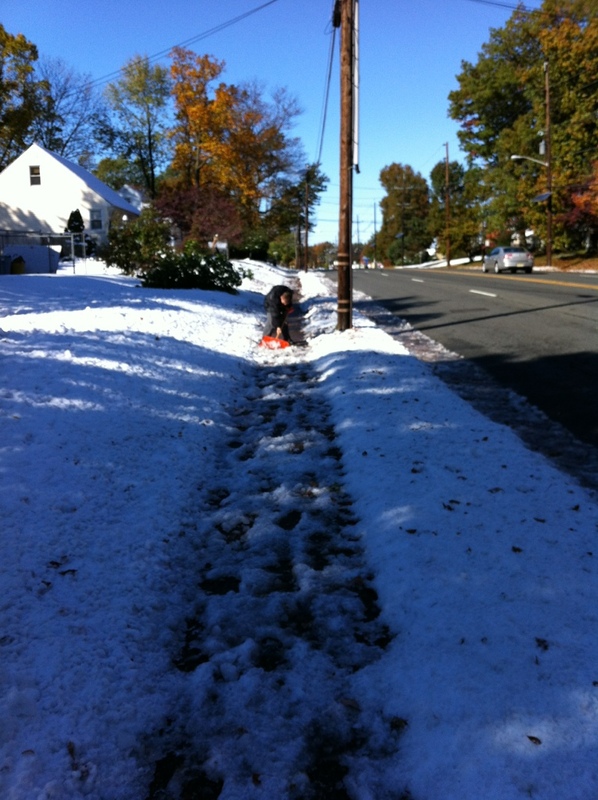 After church yesterday Peter and I shoveled snow for the first time this season. Usually we would be raking leaves at this time of year, but Saturday’s snow storm was quite a surprise and even took out power in Ewing for several hours on Saturday night. I ran 20 miles at Mercer County Park with Bill Scannon this morning. It snowed yesterday into the evening, even though Halloween hasn’t come yet! This caused more than 600,000 power outages across NJ including my home which slightly affected my punctuality for the 5am run. So that made today’s training run tough, not because it was 20 miles but because the Mercer County Park bike/running path was frozen over with ice and snow. It was particularly difficult to see where the ice and snow were on the path at 5am, even with my headlamp. So my plan of running consistent 8:30s was crushed. I had to slow things down to about a 9:00 pace for the first ten miles because of the conditions. This run was not ideal for marathon PR training, but it was a tremendous workout for all my stabilizer muscles. Even after ditching the path and running the roads, we still encountered lots of frozen spots, much of it black ice. When we met up with the rest of the Sunday morning distance runners at 7am in the East Picnic Area, we recommended they skip the path and stick to the roads. Once the sun rose things got a little better (note: a little, not a lot better). So we managed a few 8:30s and 8:40s in the last ten miles. This was to be my last long distance training run before the Philadelphia Marathon three weeks from today, but now I’m tinkering with the idea of a second long training run later this week. Nice running with you today Mr. Scannon. That was incredibly easy. The folks at WordPress make it very simple to post blog updates from an iOS device. The app was free and configuring it to post to my self-hosted blog was a piece of cake. Perhaps this will help me post more regularly to my blog. See you soon. I have been pretty negligent with my site; I doubt anyone really reads it anyway. My last post is from May 2011… Life gets busy and there’s little time for writing updates. I’ve turned toward posting updates on facebook.com much more frequently than on my wordpress blog. It’s just easier since I have an app on my iPhone for it. I’ll have to see about changing that. Perhaps there is an iPhone app to make it easier to post. It’s about four weeks until the Philadelphia marathon, and only three weeks until the Tough Mudder. My plan is to qualify for Boston 2013 at this November’s Philly Marathon. Based on my age, that means I now need a 3:10 finish to qualify. My performance at the recent Asbury Park marathon leaves me with much doubt that I can accomplish the task. Sure, there was wind and sand on the boardwalk, and most of the mile markers were missing. But really, how can one truly gauge how they will perform on marathon day when all the training is done at different speeds? Slow long runs, fast repeats, easy runs, etc. My last set of Yasso 800s averaged out to about 3:06, but that’s not really a very scientific indicator. I ran a good 15 miles on the tow path with from friend Dimitri yesterday. The pace was 8:28, which I was happy with. Unfortunately, my kneecap is suffering some pain from that run. Hopefully today’s workout and stretching help it recover. I’ll use ice again tonight too. And my Tuesday morning yoga class always helps to set things straight. I really need to get in a speed workout tomorrow, and I’d like it to be another set of Yasso 800s. You are currently browsing the Sconzo.com weblog archives for October, 2011.